One of the reasons why the whole world mourned because of the death of Steve Jobs, is not because they would miss him, but because a lot of people are saddened and afraid by the fact that there wouldn’t be any new devices from Apple are going to come out anymore. We have already shared with you in the past, that before he died, Steve Jobs could be dreaming of invading the television set industry as well, as he is planning for an internet-integrated television set. No, we’re not talking about the already existing Apple TV, we’re talking about something else. It has been rumored already quite a few years ago, but the reason as to why it hasn’t been released yet is a big secret. In all honesty there’s a huge possibility that the Apple TV is finished already, and it’s just hidden somewhere inside the Apple headquarters because they’re still waiting for the perfect timing. Well, enough of that, let’s move on to the subject. 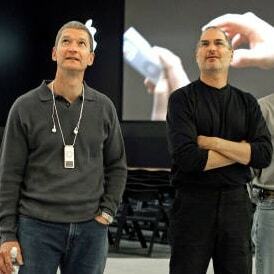 Steve Jobs is gone and Tim Cook is taking over from now on. In fact, Tim Cook has already “replaced” Steve Jobs months ago when Steve resigned from his position from the company because of his ailment. We all know that Steve is leaving Apple in good hands, but of course it’s still not going to be the same given that the great inventor is dead. What does the future hold for Apple? Are there going to be new products? Maybe. Maybe not. Who knows? One thing is for sure though, it’s not going to be the same without Steve. Steve knows this for sure, that’s why he handed down everything to Cook, telling him to think and act on his own, and to not get stuck on thinking about what he’s going to do if he was still alive. Of course, this is easier said than done, given that Steve has made a huge imprint on the what Apple means as a company and as an innovator. We also know that Cook, as well as the whole Apple itself is still struggling right now. There is a huge reason why, and there is proof that Steve could be struggling from where he is right now as well. Walter Isaacson, the author of Jobs’ biography shared that Jobs’ though that Cook is not an innovator. He’s not the type to create new products for the company. He is good in operations though, that’s why it was Cook whom he handed down the company. He knows that Cook will do everything to make Apple continue, and live on. And if that was enough for jobs, that should be enough for us too. It shouldn’t take too long until Apple’s operations get back to normal. We also know for sure that even though Jobs is one in a trillion, there are other brilliant minds out there waiting to be discovered. Apple would sure discover one of those someday as well. Aside from that, Jobs knew that his time on earth is limited already so it’s not surprising if he left a lot of notes and plans for Cook to check out and make possible.